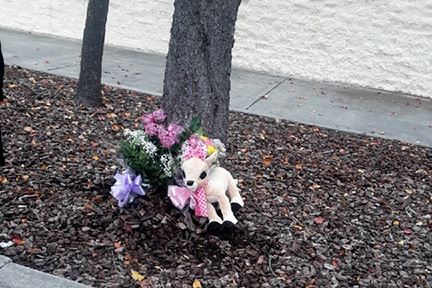 A 3-year-old girl who was struck by a vehicle in the Sears parking lot at the Somersville Towne Center Mall in Antioch has been identified as Angela Nguyen, a Brentwood resident, according to the Contra Costa County coroners office. On Tuesday, a memorial at a tree near where the crash occurred was created and according to the mall, a moment of silence was held. According to Antioch Police, the incident occurred Monday approximately 7:32 pm in the 2600 block of Somersville Road on a report of a vehicle collision involving a vehicle vs. a pedestrian. Upon arrival, Antioch Police Officers located a 3-year-old female juvenile in the parking lot of Sears non-responsive. Life saving measures were started until relieved by medical and fire personnel. The juvenile was transported to a local hospital where she was later pronounced deceased. Antioch Police Traffic Investigators responded to the scene to conduct the investigation. Drugs and alcohol do not appear to be a factor in this collision. The driver remained at the scene and is cooperating with the investigation. “Thoughts and prayers” are the equivalent of letters to Santa for adults. How devastating to lose a child 😭 Prayers going up for the family and friends of this precious child for much needed comfort and peace that only God himself can truly give. My heart aches for your enormous lose. God be with you all. It is very devastating. Not only for the loss of a little one but for the driver as well. I can’t imagine living with the fact that I killed a baby girl. 🙁 I’ll bet the person will think about this every single day forever. This is beyond belief! How did this happen? In a parking lot where cars usually drive slowly? Was the driver distracted while looking for a parking spot? I’ve seen people not paying attention looking all over the place instead of watching people crossing! When I am in a mall parking lot, I won’t go faster than 5 mph. Why was the child not with their parent? Straight up! Where were they?? The SEARS stores are on their last leg! Most have been shut down. They no longer care about what’s going on in the parking lot and maybe that is the job for the mall owners. Hang on to your kids for dear life. NEVER let them walk behind you no matter what. Ya know, it has NOTHING to do with weather Sears is closing or not. It’s the MALL that should be responsible for the lighting. NO MATTER WHAT STORE IS OR ISNT THERE. Somebody list their little one…. THATS the issue here. Accidents happen. But they CAN be avoided.. my thoughts go out to all involved… I’m sorry for the loss of the little one….. Ya know, it has NOTHING to do with weather Sears is closing or not. It’s the MALL that should be responsible for the lighting. NO MATTER WHAT STORE IS OR ISNT THERE. Somebody lost their little one…. THATS the issue here. Accidents happen. But they CAN be avoided.. my thoughts go out to all involved… I’m sorry for the loss of the little one…..